Tasty Colours: Revisiting Recipes from 17th Century Part 2. Sweet and Sour Journey to Baroque Poland – Braised Lamb with Capers and Raisins. Topinambour. Revisiting Recipes from 17th Century Part 2. 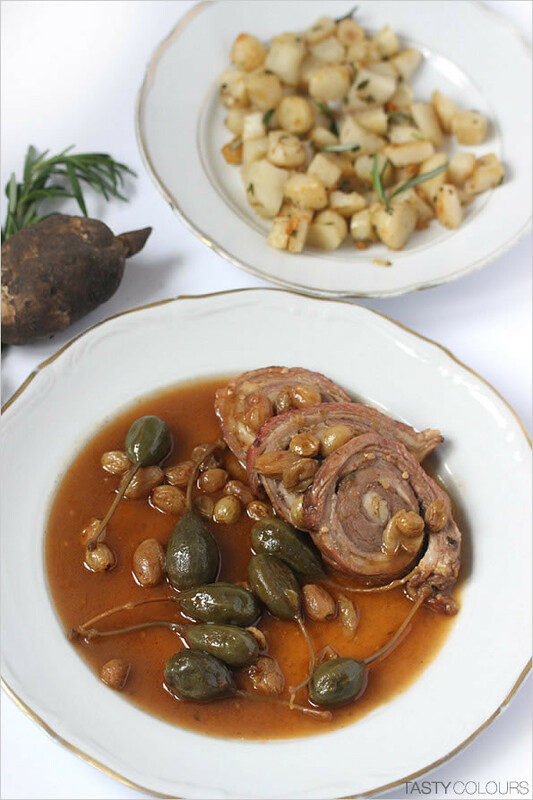 Sweet and Sour Journey to Baroque Poland – Braised Lamb with Capers and Raisins. Topinambour. When I finished my cooking, it was already dark. Because I photograph my meals only using day light, I got up early on Sunday, did the session and shot the pictures in bizarre positions which made my back hurt like hell. Below is the reprint of the first Polish cookbook by Stanisław Czerniecki. It is not an easy “cookbook”. It does not provide for any measurements or proportions so, really, you have to rely on your own imagination, taste and some historical knowledge which fortunately is presented in an interesting and very well written introduction of professor Jarosław Dumanowski. 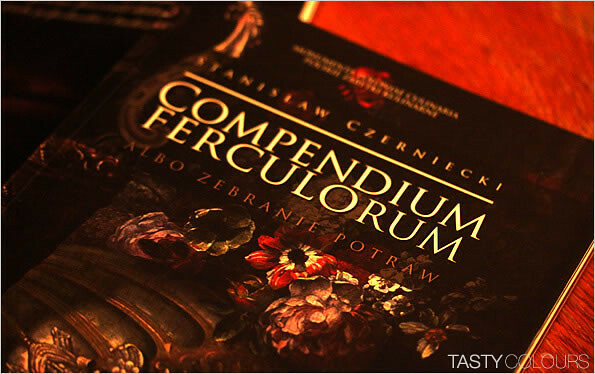 The book, published recently within a series called “Monumenta Poloniae Culinaria” - is an elegant and very nicely published work of 240 pages done by the Wilanów Museum in Warsaw, the Nicolas Copernicus University in Toruń and Lubomirski Foundation. There are 333 recipes, which are short, even extremely brief (“take an animal, cut it into smaller parts, cook it, and in the middle of cooking add this and that”). Fortunately the book contains a glossary of old Polish culinary terms and quite a lot of reproductions of old paintings and pictures which somehow guide you. Remember that the recipes presented below reflect my personal attempts to test ancient, Old Polish cuisine rather than an attempt to reconstruct an authentic taste and flavor which – as I wrote in my last post – probably would not be edible according to our present taste. Those cooks of the 17th century used to add too much pepper, sugar and acids. I started with the dish which I liked most - braised lamb roll - which I decided to do at the last minute, after I discovered that I had some spare, cheap lamb’s meat, perfect for braising. The combination of acid and salty capers with sweet raisins and vinegar, enhanced by home made veal stock was tasty, in particular with an ancient root vegetable called Jerusalem artichokes fried with goose grease, rosemary and garlic. Jerusalem artichoke was very common in Poland 200 or 300 years ago but disappeared completely from Polish tables and menus. I tried it for the first time two years ago. A week ago, I was given one kilogram of these interesting roots by my friend, who writes an excellent blog about wines. The Jerusalem artichoke arrived in Old Poland, to the best of my knowledge, from America and became popular later on. Nowadays you will not buy it in the groceries. People who have family houses in the countryside say that it grows widely in many locations, it is extremely expansive as a plant, so it is not so difficult to find. For this type of dish you can use a cheaper and greasier type of meat like, for example, ribs - once you separate the meat from the bones, you can roll the meat and tight it with a string; such a meat in my opinion is best when braised slowly so it melts into your mouth. However, you can use other meats like poultry, goose, duck or veal. Pork would be fine as well, although don't forget that in 17th and 18th century Old Polish cuisine pork was not popular at all. 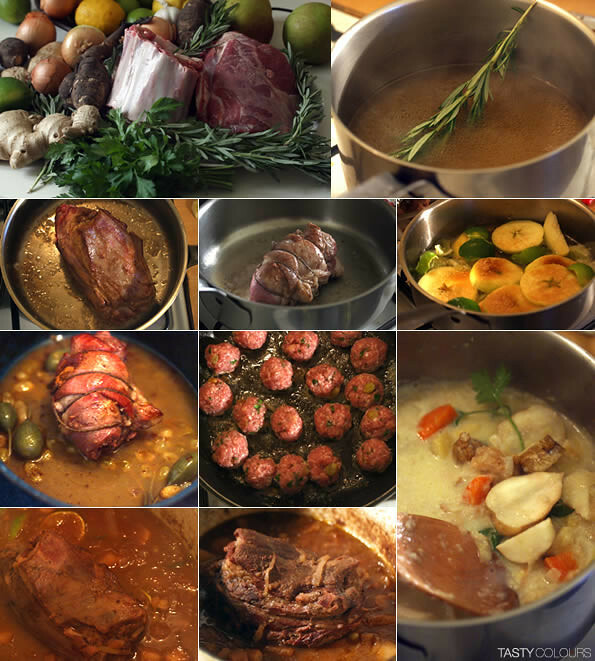 My addition to the recipe has been homemade veal stock as well as wine, to enhance the taste. It was pretty delicious! Rub the meat (at room temperature) with salt and pepper on both sides and with garlic on the inner side. Roll the meat tightly and knot it with string. In a sticky saucepan, warm the grease (clarified butter) and fry the meat on all sides. Don't burn it. Put into a small skillet. Deglaze the pan with white wine and pour the liquid into the skillet. Pour the stock, veal stock and braise until soft (in my case, it took nearly 2 hours – the meat was of a rather poor quality - it needs long, slow cooking). Occasionally check if the juices did not evaporate, pour some juices with a ladle over the meat. When the meat is nearly soft, add caper berries, raisins with the soaking liquid, cinnamon, vinegar. Play with you taste and adjust accordingly. At the end, add sugar, salt and pepper. My guess that this dish should be sweet and sour. Cut into slices, and serve with sauteed topinambur. If you do not have any, make a pea puree or millet (potatoes were not eaten in Poland in the 17th century). Heat a saucepan. Once hot, add the grease and Jerusalem artichoke (if kept in water before, dry it out with a paper towel). Sauté for one minute over a quite high heat and add garlic, sauté for one more minute being careful - do not burn the garlic. Add wine and cook over a quite high heat until wine evaporates - approximately 5-10 minutes. In the meantime, add rosemary. 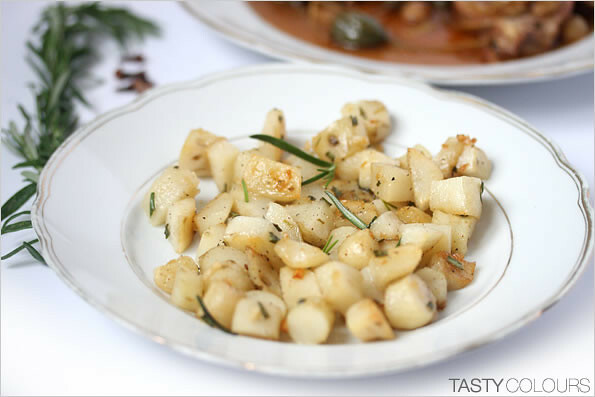 Once the Jerusalem artichoke is quite soft, add salt and pepper to taste. Serve hot as a side dish to your meat. hah, staropolskie przepisy... w tym cudownym kraju jagnięcina jest OGROMNĄ rzadkością, a jeśli już się znajdzie to ceny są zabójcze. Ech. I see you have managed to decipher those recipes quite well. What puzzles me however, is such a small number of responses to your posts. Have you blocked adding comments, or is it only salads, sweets and mama's cooking that our foodblog viewers are looking for? Anyhow, if you happen to be in my area, just come over without invitation. We've loads of lamb on this island, so there'll be enough shanks, legs, racks and shoulders to recreate every ancient recipe you can unearth. We're also well supplied in Jerusalem artichoke department, so no compromises there. Wow, Sweet and Sour Braised Lamb Rolls with Capers and Raisins looks amazing! Thanks for sharing the recipes, I will have a look!